Desiree Macke, congratulations girl, you just won the March giveaway!! Email me at thelifeofbon@gmail.com and we'll get you hooked up. Wait a minute... is this the same Desiree that's going to be the next Bachelorette? Because if so, I think you have had enough good luck already and you should give all the free goodies you be getting to someone else! I'm sure you've all heard google reader is shutting down. People are freaking out. Like throwing blowdryers across rooms and killing their pet hampsters freaking out. I don't think I even really know what google reader is so I'm not too concerned. Plus, I figure if people want to read my blog, they will still find a way. All the rage has been bloglovin. It's very easy to follow me there. All you have to do is click here and then click the blue follow button that pops up. Wow, that was so easy! Also I am listed #26 on "Up and coming blogs". I'm not sure what that means, but I feel like I should celebrate! Wahoo! I am up! I am coming! 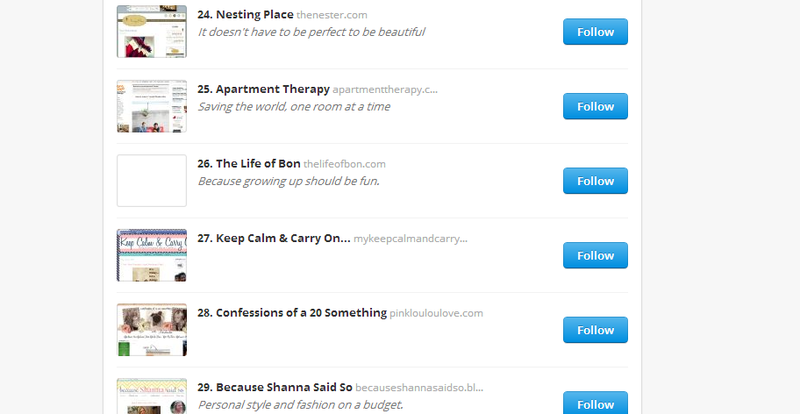 There are only 25 blogs that are more up and coming than I am! If bloglovin isn't your thing there's twitter where I post lots of nonsense that crowds my brain. Or instagram (@thelifeofbon) where I post the picture rejects that aren't good enough to make it to my blog or pinterest where I post pretty much nothing that has anything to do with my blog. Or facebook where my mom hangs out. Oh, the options are endless! I am kind of falling in love with Saturday mornings. It's pretty accurate to say that from the ages of 14-26 I didn't have much of a relationship with Saturday mornings. Oh, I knew Friday nights very well and I was all too familiar with Saturday afternoons and evenings, but Saturday mornings I was usually dead to the world. Now that I am turning into a wise old woman, I wake up earlier on Saturday mornings. No more of this sleeeping in until noon crap. And you know what I discovered? Saturday mornings are a beautiful time of week. The craziness of the day hasn't yet set in, you still feel like you are at the top of the weekend, and no body calls you on the phone. (Confession: I hate talking on the phone. Almost more than anything.) And here I've been going year after year without even bothering to notice Saturday mornings. Here's to you, Saturday morning. Here's to developing some kind of relationship, me and you. I'm warning you, though, I'm very non committal. I might be here some days, and other Saturdays I'll be nowhere to be found. I hope you can handle that kind of a relationship. For the rest of you, have you started reading The Fault in our Stars yet? I started this weekend and am in loooooooove so far. Don't forget our discussion for that book will be March 28. Be there, suckers. And now, for some light weekend reading. May your Saturday and Sunday be full of sunshine and butterflies and you know... Happy stuff! +My sister comes home on Tuesday after 19 months in Argy. EEEK! This is what I wrote to her when she left. +This is what I wrote to her when she had been gone six months. I missed her. +My time in Argy prompted me to write this about breast feeding. The ladies down south bare it all. Why do Americans gotta be so freaking modest?! +Two years ago at this time I was on a honeymoon. This is what happens when you get honeymoon siiiiiiick. +Speaking of honeymoon, we got royally screwed over by a guy named Larry. You can read the juicy details here. Enjoy sweet cheeks. I'm off to play some tennis! I still feel really lazy on Saturdays! I woke up at 11:30. I had no idea goggle reader was ending, nor do I know what I means. My other book clus is reading A Fault in the Stars, so I may jump on the book club wagon here, too. And I love early Saturday mornings, almost as much as I love reading your blog!! I love driving around town on Saturday mornings. Not a soul around, just me and my radio. I just started the book yesterday and it is SO good! I've been enjoying Saturday mornings more often too! This Friday I had off due to the end of the term and I still got up pretty early and went running. Sigh, how I miss mornings. You have them as a teacher, but you don't get to enjoy them. Eeeek!! Thank you for such an awesome giveaway! The luck of the Irish was with me this weekend. I sent an email your way. Hope your enjoying your St. Patty's Day! Read it in a couple days! Pretty much one of the best books I've read! My sister just recently read that book...and told me that I should read it since I recently suffered from a brain tumor. My sister said it hits close to home and is definitely relatable in my case, so I am very much looking forward to reading that book.